When it comes to game day experiences and college football in general — the South rules. Since the inception of the college football playoffs, nine of the 16 teams to compete are Southern bred, six of the eight teams to advance to the National Championship are Dixie proud, and the coveted trophy was won by Southern teams three out of four times. But that’s recent history. The South’s passion for college football dates back to the 1926 Rose Bowl when Alabama defeated Washington. That win extended far beyond the playing field. At the time, the sport was dominated by elite Northern schools like Harvard, Princeton and Yale. For Alabama — from the deeply depressed South — to claim victory was more than just a statement of sportsmanship, it was a statement in pride of place. Today, that pride has developed into game day experiences full of tasty tailgate traditions, grand regalia and some of the wildest pomp and circumstance in the country. 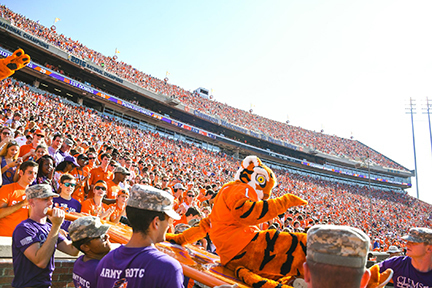 Broadcaster Brent Musburger proclaimed the University of Clemson’s entrance into Memorial Stadium — also known as Death Valley — as “the most exciting 25 seconds in college football.” The team exits their locker room and boards three motor coaches for a ride around the stadium to the top of the hill where coach Dabo Swinney leads the team off the buses, past the rock from Death Valley, California, where players touch it for good luck, down the hill, and onto the field where over 80,000 Tiger faithful thunder to life as the marching band blares the school’s fight song. As exciting as the team entrance is, festivities begin hours earlier at one of the most elaborate and hospitable game day experiences in the country. A lucky few begin their game day experiences at one of the most unique tailgating parties in college football. Or, as they say in Columbia, railgating parties. Twenty-two retired cabooses from Illinois Central Railroad are parked on a spur on the southeast side of the stadium. Each privately owned Cockaboose is lavish with kitchens, flat screen TVs and the coveted indoor bathroom. The tailgate lots that surround the stadium are plentiful, and, with their scarlet oak canopies, are considered to be some of the most beautiful in the country. Mountaineer fans flock to the hills surrounding Kidd Brewer Stadium on Saturdays to watch their team defend The Rock. Game day experiences begin in the morning and rock until kick-off. 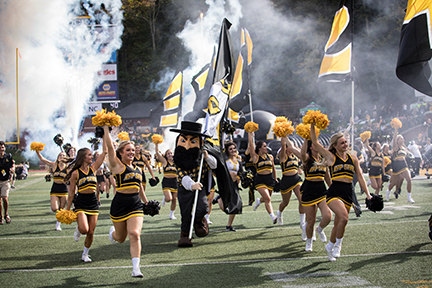 “The fun thing about tailgating is hearing all the generators turn on,” says Jim Stout, App State alum and passionate tailgater. Those generators are powering scores of tailgate tents decked out with black and gold Mountaineer paraphernalia, satellite TVs, food buffets and fully stocked bars. “Our food normally targets the school we’re playing. For Louisiana, you could find gumbo and spicy Bloody Marys,” says Stout. 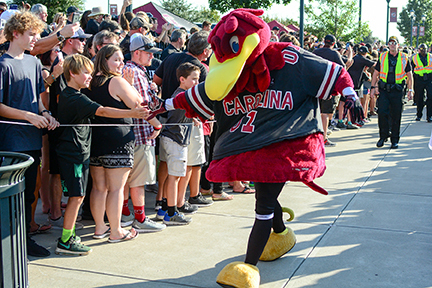 What really gets fans into the football spirit though is the band, which breaks itself into segments and disperses throughout campus to fire up the crowds before they head to the stadium. That walk first involves a stop at the infamous rock where fans touch it, rub it or slap it for good luck. 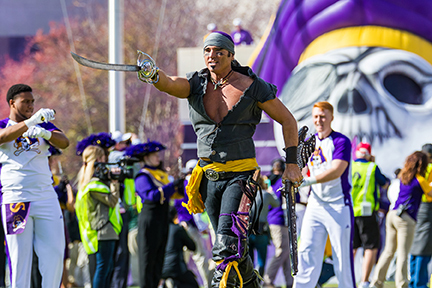 ECU fans are purple and gold pirate proud — young and old arrive fully dressed in pirate or skull and cross-bones costumes for their game day experiences. Crowds converge on the tailgate lots which open six hours prior to game time. Of course, expect lots of vinegary and smoky whole hog, Eastern North Carolina BBQ. “It’s the social event of East North Carolina,” says Lee Workman, acting chief operating officer for athletics at ECU. The pirate theme continues when the team enters the field from the mouth of a skull under plumes of purple and white smoke to the song “Purple Haze” blaring on Dowdy-Ficklen Stadium’s speakers. They’re led by professional actor, Steve the Pirate, to a roar of a thundering cannon. That cannon also thunders after each score to the delight of fans and fright of opponents. The most exciting moment for many, though — especially fans sitting in the student section dubbed The Boneyard — is the ushering in of the fourth quarter. The traditional Jolly Roger battle flag is lowered and the “No Quarter” flag is hoisted. In pirate lore, the no quarter flag signifies that the attacking pirates plan to take no prisoners. “When people think of tailgating at Tennessee, the first thing that comes to mind is sailgating and the Vol Navy,” says Drew Rutherford, general manager of Tailgate Tennessee. Scores of boats — from million-dollar yachts to modest crafts — tie up along the Tennessee River, which runs adjacent to Neyland Stadium. The tradition started in the early 1960s when then Tennessee broadcaster George Mooney grew tired of game day traffic and floated his runabout along the river where he anchored outside the stadium. Today, expect to see boats big and small outfitted with all the essentials for ideal game day experiences — flat screen TVs, grills, stereos, kegerators, bedrooms, bathrooms — you name it. On the dry side of the stadium, you’ll find a tailgating experience similar to the Quad at Alabama or the Groove at Ole Miss. 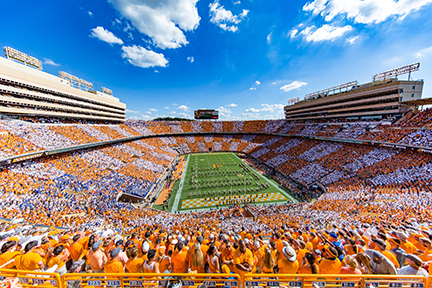 Tailgate Tennessee consists of three acres of luxury tailgating tents where fans pull out all the stops. “I once saw dueling pianos at a tailgate,” says Rutherford. “You’ll find loads of BBQ (Western North Carolina style), ribs, and, if you’re there for the Florida game, people handing out samples of gator.” All washed down with an Ice Pick — sweet tea, lemonade and Tennessee whiskey. Those tents clear out for the Vol Walk. The team gathers around the Torchbearer statue and led by the marching band and cheerleaders into the stadium. The half-mile parade ends with the marching band turning toward campus and playing “Salute to the Hill,” a three-song melody capped by, of course, “Rocky Top." There isn’t a more beloved mascot in college football than the University of Georgia’s chubby and slobbery Uga. 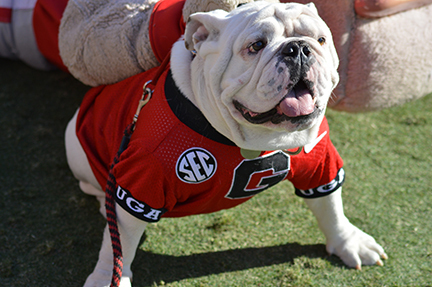 The white English bulldog that can be found roaming the sidelines during games comes from a long bloodline of Georgia proud bulldogs dating back to the 1950s. That ancestry is memorialized in marble vaults on the south side of the stadium where those who came before Uga X are laid to rest. Many members of bulldog nation touch or kiss the wall for good luck before the game. The game day experiences begin well before kickoff though at the tailgate parties. “It’s a way to celebrate friends while watching Georgia football,” says Jimbo Laboon, UGA alum and serial tailgater. He and a few friends secured a tailgate spot in the mid-‘80s. Today, 125 families participate in his tailgate with upwards of 500 people on any given Georgia football Saturday. Visit AAA.com/Travel and start planning your game ay experiences — maps and reservations for hotel, car and airlnes are available online.